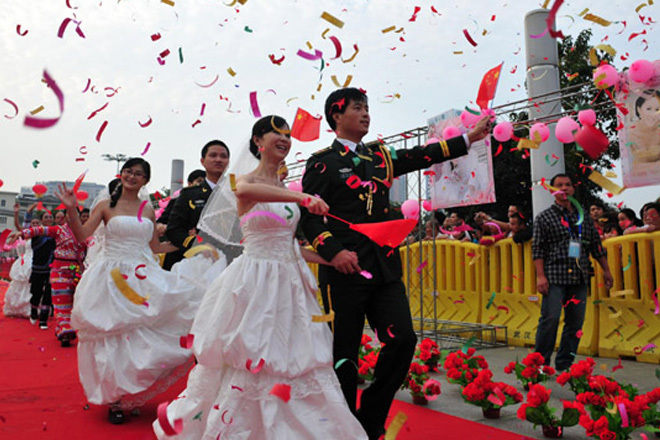 Dec 08, 2016 (LBO) – Sri Lanka’s capital Colombo has been chosen by 200 Chinese couples to hold a mass wedding event. Tourism Development Minister John Amaratunga told Parliament today there is growing interest among the Chinese and Indians to hold mass weddings in Sri Lanka. “Already, reservations have been made for 200 Chinese couples to conduct a mass wedding in Colombo,” Amaratunga said. He did not give details of when the wedding will be held. Commenting on the potential for meetings, incentives, conferences and exhibitions (MICE), the Tourism Development Ministry is on the look out for a suitable space to construct a 3,500 seat convention centre in Colombo, as such a facility will help to attract MICE traffic from India and China. The ministry also wants to increase room inventory from the current 25,000 to 45,000 in the formal hospitality sector in the next couple of years. The hotel school will train 6,075 persons this year as opposed to 3,000 last year in order to cater to the growing demand for skilled personnel in the hospitality sector. The government hopes to achieve the objective of tourism sector being the number one foreign exchange earner in the country by 2020.